The answer? PEOPLE! 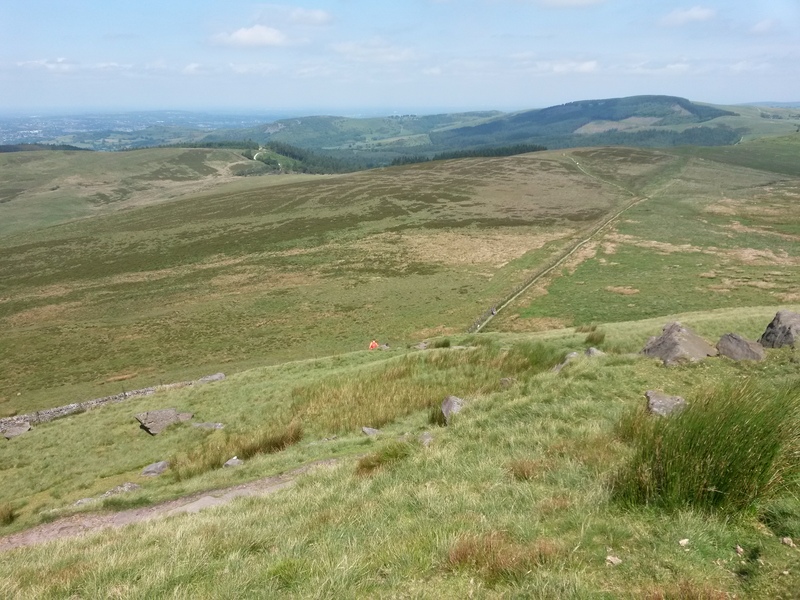 (Well, you may just see a disappearing blob of orange in the distance in the first photograph, but we do have to keep the detail-spotters happy). 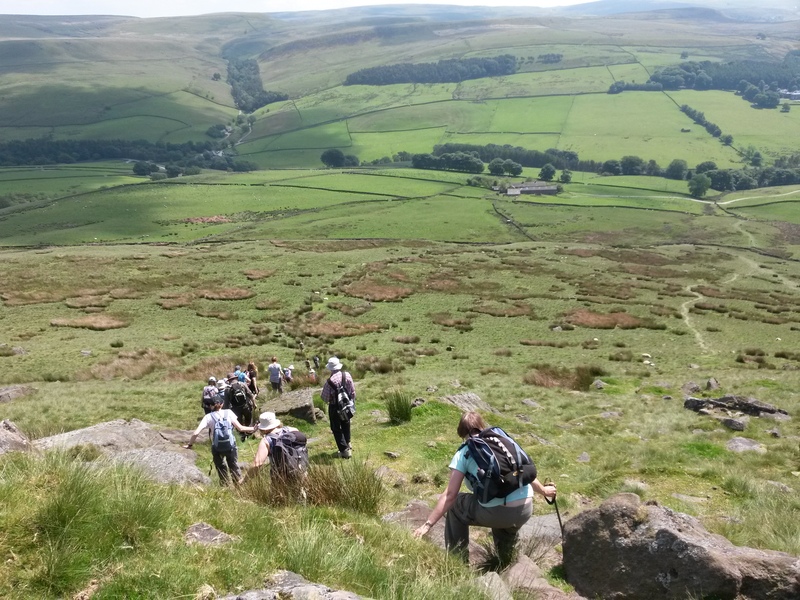 Of course the scenery is beautiful either way (we were walking at Shutlingsloe) but the whole point is: people make things better. Not only do they make things better, they help us to gain perspective – whether that’s the size of the mountain we are climbing or the way we relate to things and to other people day to day. Why am I suddenly so interested in people as an under-appreciated thing? Well, recently there have been two factors that are steering me to value all over again how amazing human beings are. I thought I’d share them with you. Firstly, I have been having spammer problems with this WordPress blog. Of course we are all used to spammer problems in this weirdly wired-up society, but it doesn’t half irritate me. Also, if I am not in a good state of mind, it can make me extremely anxious. I don’t need to know, repeated times a day, that gobbledygookname@outlook.com is following my blog and will receive an email whenever I post. And it doesn’t help that goobledygookname does not appear in my list of subscribers so I am denied the satisfaction of deleting them. The problem with spam emails resulted in an acquaintance of mine suggesting that I add in one of those neat little tick boxes with the words ‘I am not a robot’ beside it. This is apparently not within the remit of the basic WordPress functionality that my blog is limited to, but it got me thinking about how, in a world where we have to formally admit to all and sundry that it is actually a human being trying to communicate online, we totally under-appreciate the qualities and importance of other people in our lives. Secondly, and following on from this, is the fact that I am currently battling depression again big time. I sit around weeping and trying to force myself to face the day. It hasn’t been this bad since I was in my dysfunctional twenties and it’s scary. However I have become more resilient and self-aware over the intervening decades and when I hit rock bottom recently I pinged a few texts out to some of my lovely friends and waited on the outcome. 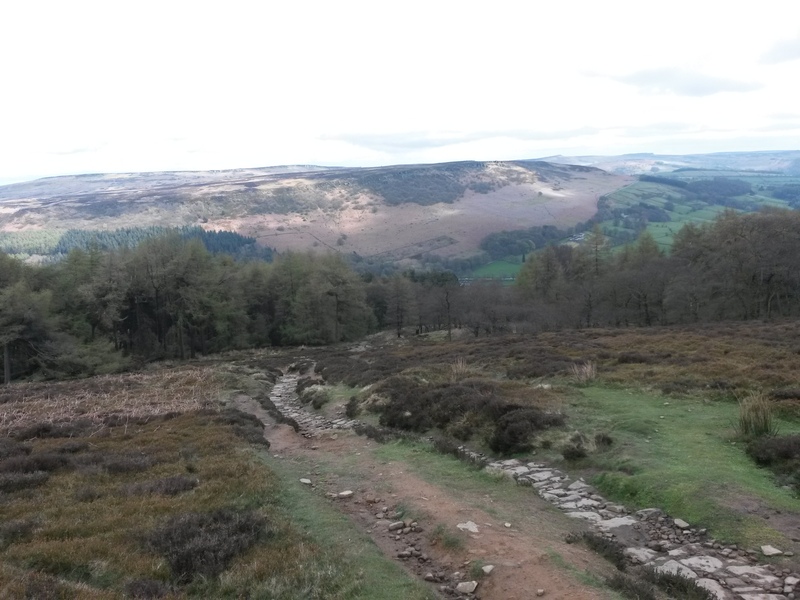 The result was supportive phone calls and texts from a couple of friends and a lovely day out walking with another. Human beings are what make life meaningful and we just don’t appreciate them enough! unpredictable world, transforming it as we go. Oh yes, Anonymous, my rather sparkly house sharer, this one is definitely for you! I love fairy lights. And, it is fair to say, now that Christmas is over, that my house still boasts it’s fair share of colourful twinkly things. There is the set of glowing red flower-shaped ones in the lounge and the delicate woodland glow of a garland of tiny green lights that creep along the picture frames above my piano in the dining room. I have also acquired a set of multi-coloured fairy lights in my bedroom, trailing around a pair of black metalwork candle sconces. This set crept in stealthily – appearing at Christmas and then proving so irresistibly pretty that I couldn’t take them down. And this is just on the inside! Go into my garden at night and you will find a magnolia tree garlanded with glowing balls in shades of pink and green and blue (if the sun shone that day, of course – the lights being solar-powered) and various lanterns standing sentinel at the corners of flower beds. One of my favourite things to do is to sit in my conservatory (festooned with wooden cut-out lantern fairy lights, of course!) on a summer’s night with a few candles added to the mix, looking out on a garden that is pin-pricked with lights, holding a glass of good single malt (as peaty as possible) in my hand. My lodgers, too, have shown a great fondness over the years for these multiplying mutants, festooning the beams and angles of my attic room with light and colour. My favourite were a set of beautiful pink flamingos. Another quirky design was to be found in a friend’s kitchen, where glowing red chilli peppers ran around the ceiling as you chopped and sautéd and blended. Of course fairy lights are not always trouble-free. I positively dislike the icy glow of the newer LED lights – they may be low energy but they do not have the warmth and beauty of the good old-fashioned types. These you don’t appear to be able to buy any more – which is a pity because the bulbs eventually blow and cannot be replaced leading to the necessity of early disposal or intermittent gapping if you can by-pass the fuse bulbs. (No, I didn’t advise that!). One of the problems with the appreciation of fairy lights is that people go into overkill. They use them everywhere – up every wall and window – until you might as well have put in a couple of giant search lights instead. At Christmas I feel sorry for the National Grid – and for all my eco-minded friends who have campaigned and scrimped all year to reduce power consumption only to have their targets blown in a week or two by people who think that the front of a house is not complete without snowflakes and santas and reindeer lit by a thousand watts. But fairy lights, as their name would suggest, have a bit of magic about them. You can’t be sad when there are fairy lights. Well, maybe you can be sad in a slightly melancholy way, but the fairy lights are bound to keep you company and cheer you up a little. If I’m feeling low I simply switch them on and everything feels instantly better. On reflection – and the reflection of fairy lights in a dark winter window is hard to beat – maybe fairy lights should actually be in a list called: ‘In Praise of Ten Rather Over-Appreciated Things’! The huge long lonely drive all the way down to Cornwall on my own in pouring rain (necessitated by my promising man walking out on me the night before) – Oops. In anticipation of the New Year I thought that I’d try something new with my blog and give you a ‘mini series’ to savour. And what better way to start the New Year than with a post about Masking Tape! Last week, my internet connection was playing up. According to my house-sharer (who uses the internet for long-enough periods to notice, unlike me) it was going down every couple of hours for ten minutes or so – certainly enough to make watching her latest Netflix series genuinely annoying. We exchanged watching Netflix for watching the lights on my router – a flickering bundle of green and red to compete with my Christmas tree. Sadly, the intermittent red showed there to be a problem, Houston. There followed telephone calls to my phone and internet provider (yes, I am still on a phone-line system for my computer needs!) and to a local DIY store to order and replace the parts that might be going wrong. It could be, I was assured, the connection box on the wall (my cost and more hassle if so), the filter, the phone divider point, or the router itself. The bits duly arrived and were duly tested in due order and we may (or may not) have sorted the problem. So what, you ask, does this have to do with masking tape? Well, as the photograph below illustrates, the phone point connection into my house is located in a very awkward place on the wall above the narrow end of the windowsill of the bay window of my lounge. In addition to the risk of the wiring and filter being moved when the curtains are drawn, there is nowhere to sit the filter or ongoing connections – which would then naturally dangle from the phone point like a tumbling acrobat tower. Enter the masking tape. A couple of wide strips to anchor the filter to the end of the windowsill with the ongoing wires pointed in the right direction, and we are sorted. This got me thinking about how much I love masking tape – and about how many other under-appreciated things I might write about. I made a list, but – TEASER WARNING – you’ll have to read on over the coming months to find out what made it into my top ten! 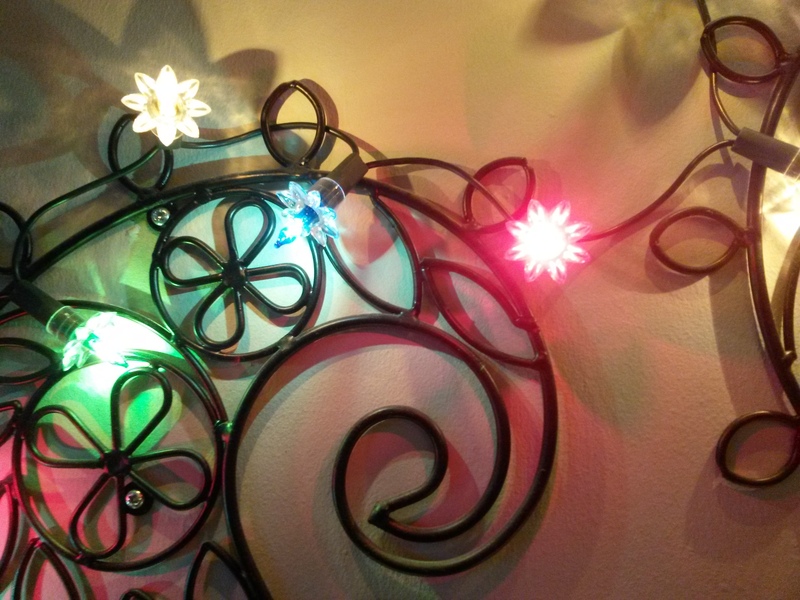 • What better way to anchor the wire of the fairy lights that I wind up the stairs at Christmas? Masking tape traps it to the floor where the wire goes from the power point, under the rug, to the stairs on the other side of the hall. No risk of tripping, unless you’ve been mixing those Christmas drinks again. • When I am painting my skirting boards I can whiz along quickly without fear of snaking a line of paint along the floorboards, too. They, of course, are protected by a beautiful line of masking tape. 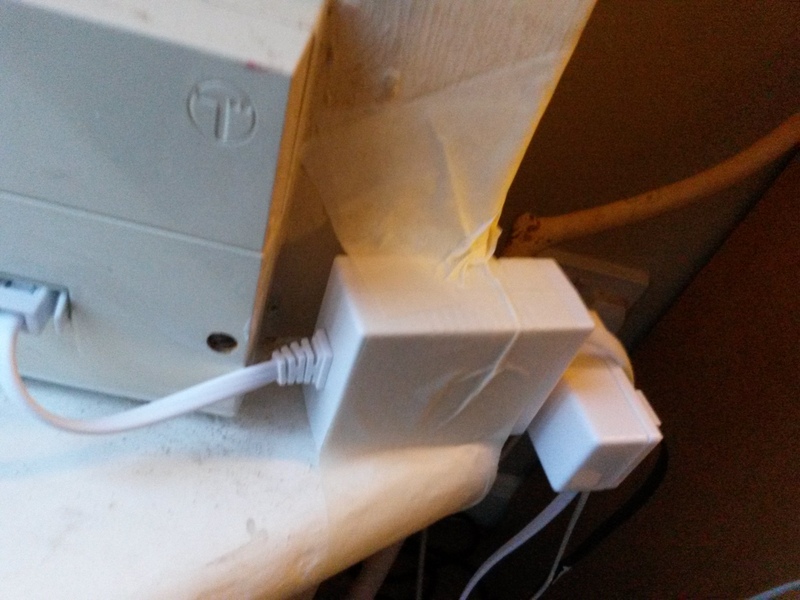 • When I am drilling holes in dusty walls and don’t want dusty carpets underneath, a small piece of masking tape angled out from the wall beneath where I am making the hole will catch all the residue on the sticky side of the tape. This has the additional benefit of being able to fold the sticky bits in on themselves to trap the dust in a nice masking tape parcel that can then be thrown away. • Masking tape cat-hair collector! Apply it to your carpet or sofa, but try to avoid the cat. (Actually, wearing plastic gloves and dampening your hands works equally well and probably collects more hair – the cat doesn’t like wet plastic gloves, either). • Good for sealing the top of the Christmas tree box in a way that holds everything together just long enough to undo it all again (without damage to the box) in a year’s time. • With masking tape you can seal the back of framed pictures but still change your mind without causing too much damage – useful for when your son changes his girlfriend or you change your cat (no, of course I wouldn’t!). Of course the definitive properties of masking tape that make it so useful are that: a) it sticks to anything, and: b) it unsticks from anything. Of course eventually it dries up and unsticks regardless of whether you want it to or not, but I am happy to forgive it this small weakness. As you will be aware from my previous posts, my father has recently moved up to Nottingham to be near me so that he can benefit from the extra help provided by a residential care setting. It has been such a joy to have him nearby, and to be able to see him regularly and to take him out to exciting things such as Mahler concerts and steam galas. During the transition period I found it really hard to write about my feelings and did a mega-copout by posting my series of articles on Simplicity instead of addressing the intense and traumatic experience of helping my father accept the need for the move. This last month has seen me too-ing and fro-ing to Dorset, together with one of my sisters, to sort out and clear my father’s house. The house is being let unfurnished to provide an income to help with care fees – a decision my father was involved in. He was also involved in all the choices that we made about what he would like to have with him and what to do with the things that the family did not want or need. Clearing the house has been alternately incredibly stressful and very moving, and was a process not made easier by having a severe ear and chest infection. Family relations have been strained to their limits, with full melt-downs followed by hugs and tears. Other people I have spoken to tell me that this is normal given the circumstances! I saw the New Year in at a local pub with my sister for company and loads of happy and somewhat tipsy people jumping up and down erratically as the TV above the bar blared out Auld Lang Syne. The first week of sorting, with my sister alongside, was too full-on to draw breath. In five days we attempted to sort out and process all the ‘family’ possessions, furniture and sentimental keepings, alongside 91 years-worth of my father’s gathered clutter. Clutter is actually the wrong word for what my father kept – he is an incredibly detailed and organized man and everything was addressed, labeled, dated and filed in strict order, right down to old school brochures, medical correspondence, and the tear-off Postcards from his Talyllyn railway calendars. Some of his Railway magazines dated back to 1904! Ten days later and I was back at the house again, and this time on my own. Despite the ever-changing personnel of decorators, electricians, window fitters, the skip man, estate agents, and the most amiable clearance team I have ever met, I managed to find time to say some ‘goodbyes’ over cups of tea and supper-invites. The strangest thing, though, was that over time the sorting began to feel like a spiritual process. I really wanted to see things find good and appropriate homes and not simply end up in landfill, and as the days went on more and more options opened up. One friend of dad’s went over-and-above the call of friendship and made multiple runs to and from the house in his estate car – collecting things to sell in a charity sale in aid of dad’s church and taking massive piles of metal, wood and cardboard for recycling. Tools went to a charity for reconditioning and reuse in countries that need them. Another friend appeared and found new homes for my mother’s sewing and tapestry materials and sewing tables. I was introduced to a local project that took away crockery, saucepans, cutlery, the TV and other household items – to be provided to vulnerable people who were setting up home with little or no money. It was as if dad’s home was opening out its arms and giving of the gifts inside. Do I sound sentimental? Yes, I suppose I am. But also I believe that if you open up your heart and long for something it will be given to you. That openness to spirit and that of God in the world allows these nurturing processes to flow. In my last day I had some time to spare and managed to still myself from the urge to set off home early. Instead I took some time to contemplate and to walk the paths I loved in the winter sunshine. I took photographs and had a coffee in a local café. I accepted the wonderful hospitality of a bed for the night and a meal with dad’s friends. There was a short, said communion service at the church. So… Now I feel ready to move on. I feel that this change has been the right thing and that the universe is in harmony with it. I am grateful that dad seemed happy and settled on my return. It is a new chapter for both of us, and I am open to where it will lead. Having the decorators and house clearance team in tandem (NOT my decision!) – what a nightmare! Trying to separate the piles the decorators needed (curtains and curtain rails, lightshades, hoover, ladders, paints, tools) and the piles to get taken away. Finding the kettle under dust-sheets!! Miraculously, the only casualty was the centre of a loo-roll holder. 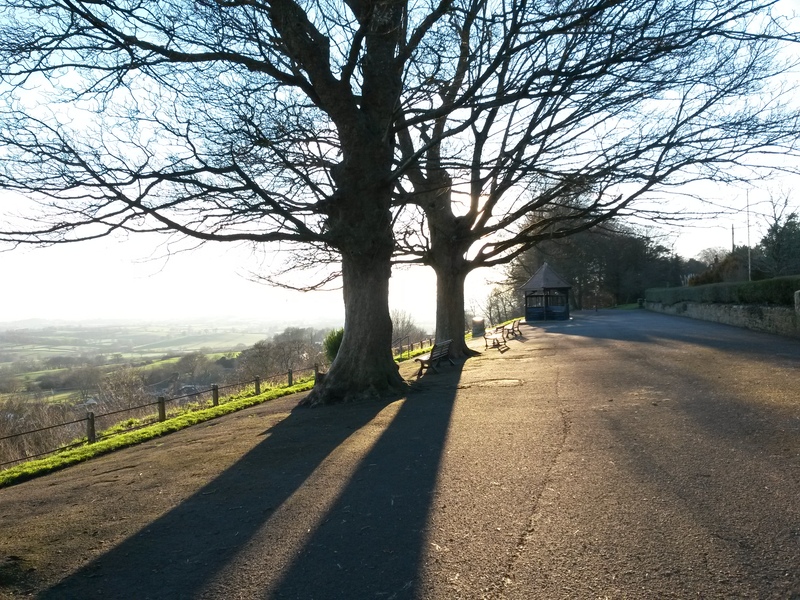 Saying ‘goodbye’ to Shaftesbury after clearing dad’s house – walking quietly in the cold winter sunshine along my favourite routes and lanes and taking photographs. It was almost a meditative process, and very moving. I have haemorrhoids. Or piles, if you prefer. Or those funny little grape like protruberances that can appear at the entrance to our gut at a part of the body that is best not described in an up-market blog like this one! They are pesky things that are common as you grow older – particularly if you suffer from Irritable Bowel Syndrome (IBS) like me. Now my IBS more-or-less disappeared the moment I went vegetarian and hasn’t bothered me since, but unfortunately the same cannot be said for the haemorrhoids. Recently I had to go for a bowel scope – something that is now provided by the NHS to people of a certain age to check for signs of bowel cancer. The endoscopist took one look at my haemorrhoids and asked why they had not been banded – a procedure where they place a tight elastic band over aforementioned protruberances and wait for them to drop off through lack of blood supply. Here we got to a problem because none of the health professionals involved seemed to agree about the best course of action. Only three years ago a consultant in Lincolnshire told me the haemorrhoids were too big to band and that the only option if I wanted to remove them was surgery – risky, painful, and not recommended unless you’re desperate. I went to my GP who, in wonderful contradiction to the aforementioned hospital professionals, advised me to do nothing at all. All the procedures can be painful, he said, and the haemorrhoids can regrow. They’re a natural thing, he said, and unlike the hospital staff a GP sees the longer-term outcomes for patients. I should check out the information available on the internet and come back to him with my decision on how to proceed. This was refreshing, but of course it immediately begs the question: what information can you trust when you search online? The internet is an amazing thing, but you have to think about the motivation of the people who post information there. Those logging their experiences are more often than not those who have had a bad time of it. It is hard to get a balanced view. NHS sites are informative, but do not give success rates or long-term outcomes and tend to come from a Western, pro-medical intervention, point of view. I attended a wonderful event recently at the brilliant Nottingham Contemporary. It was a discussion forum with the title ‘Media Gone Mental’. We considered questions about digital technology and our relationship to it. We looked at online identities, questions of intelligence and creativity, and whether digital technologies are good for us. The event was co-hosted by CaSMa (Citizen-centric approaches to Social Media analysis) and the Institute of Mental Health, as well as the Making Waves project that seeks to challenge current understandings about people who have experienced mental distress. I love Nottingham for being a city that has so many stimulating opportunities to engage in discussion and debate. People are into ideas here, and proper communication. It was so nice to sit in a circle with an assortment of complete strangers, eating the best samosas I’ve ever tasted and, if not quite putting the world to rights, at least looking at the issues head on. One of the questions posed at this event was ‘Is computer technology the democratization of knowledge or its commodification?’ This intrigued me, and I came to the conclusion that for me it is closer to the second of these options. Everything that is uploaded into cyberspace has a person or organization behind it – someone with an audience in mind and motives that are not always clear at first glance. Even our personal pages on Facebook and other social media represent filtered and untrustworthy versions of ourselves. So, when researching my haemorrhoid options, I did so with my truth-seeker antennae set to maximum sensitivity. I searched on patient opinion sites, and NHS pages, and sites where companies have a stake in selling you something. I found alternative remedies that the GP had never heard about – nutritional supplements which, after much delving, appear to have some clinical evidence to recommend them. Unfortunately these are not currently available in the UK. I learnt a lot about haemorrhoids – and that I definitely want to avoid surgery. Don’t get me wrong, I’m not a total cynic. I find the information available online invaluable. But I like the internet best for the personal connections it allows us to engage in. The internet is an fascinating place and I have encountered some intriguing people and wonderful ideas there. It may not have helped my decision about haemorrhoid banding, but I’ve learnt a lot of other interesting stuff along the way. 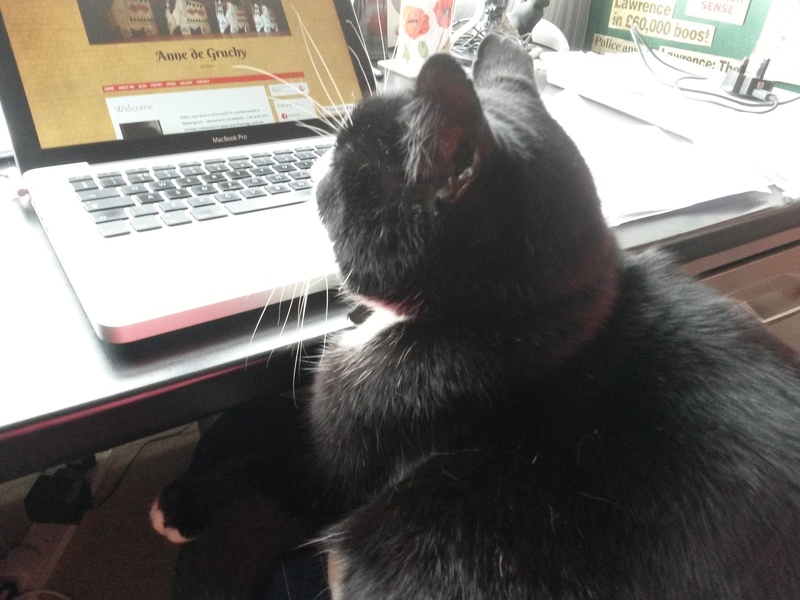 Trying to work at my computer with my cat alternately sitting on my paperwork and sitting on my lap. Returning to the Carers’ Support Group after a gap of a few months. I had been distressed the last time I attended, and was worried about how this had affected the people there, but they are a lovely bunch of people and it felt good to go back. I also received a lot of support from the Alzheimer’s Society manager on my return – so a big ‘thank you’ to everyone involved.